So after The Ion War you’d think I’d never want to deal with another Colin Kapp novel again. Gosh but golly I sure did hate that book. It had a lot going against it, and because of that, I feel like The Chaos Weapon should have had a lot of those same things going against it. Well, I’m a sucker for punishment and I found this at a Friends of the Library book sale for a dollar, and I figured I’d give Kapp another shot. Everybody deserves a second chance, right? I’ll say that this book was better than the other one. That’s not saying much, though. I’m trying to think of a good analogy but everything fails to encapsulate just how stupid and awful that other book was and how much it made me angry for being like that. The Chaos Weapon, on the other hand, at least has some things going for it. The premise is interesting. It wasn’t used to its fullest potential and there were a lot of gwuh? moments, but at least there’s that. If I have to say anything about Colin Kapp that covers both of the books of his that I’ve read, I think I’d say that each book had a premise that was highly original but not very well thought out. The titular Chaos Weapon demonstrates this well. The thing is a megastructure and what it does is modify probability. I think. Sometimes it seems like it can change the probability of something happening, other times in the book it just shoots “entropy,” sometimes it’s described in terms of that old “for want of a nail” thing, and still other times it just seems to make things happen randomly. I never figured out what this was supposed to be doing. Sometimes there were exposition dumps but they were so totally unhelpful that I realized I could have skipped them. Our hero, Jym Wildheit, is a Space Marshal. He travels around and saves people from bad things. In this book, he’s sent off to discover why bad things keep happening. While this might have turned the book into an interesting study in theodicy, the author ignored that possibility and left us with some kind of a weapon that does hard-to-explain things. The problem at the start of the book is that somebody is somehow targeting important members of the Federation. The likelihood that all of these important scientists, statespersons, and so forth would be lost in natural disasters is all but zero under normal circumstances, but lately they’ve been hit by meteors, avalanches, equipment failures, and all sorts of nasty things. These folks are TOP MEN, so it looks like somebody, somewhere, is trying to destabilize the Federation. But why? Jym, whose name is too difficult to type, sets out to discover what’s going on. The first thing he does is go to a planet called Mayo, where all the Sensitives live. It seems that a natural percentage of humanity has psychic powers, and for reasons I don’t remember they all went to live on this one planet. They have shut themselves off from the rest of the Federation and don’t like it when other people come to visit. Jym comes to visit and asks if they have any psychics who can see Chaos. I guess I should take a step back and point out that in the universe of this book, Chaos is a scientific study. Like much of the book, it has an interesting idea behind it, but everything is so poorly defined that I just can’t keep up with what the science is supposed to do. The most commonly referenced idea is that using this science a person can look at an event and then extrapolate the causes that led down to that event. It’s also suggested that using powerful computers and lots of time, one can predict the future using knowledge of current events. The book never phrases it this way, but I guess you could liken the science to being able to look down the chain of dominoes and guess when the ones across the room will fall, and how. This is not a very good analogy and I apologize. Wildheit meets a young lady named Roamer. She’s a Chaos Seer. This means that she can do in an instant what it would normally take a team of researchers a lot of time to do with really big computers. This is handy in the current situation, to be sure, but it also makes her basically a Jedi, since whenever somebody tries to do something untoward to her she can see that they’re about to do it (in the “eddies of Chaos” or whatevs) and she can respond in an instant. This happens a lot and is her primary function in the book. She whips butts. A short series of misadventures (attributed mainly to Wildheit and Roamer being dead in the sights of the Chaos Weapon) leads our heroes to a ship captained by a guy named Kasdeya, who gives us another exposition drop. Among other things, he tells us who the bad guys are and what they want, and this was actually one of my favorite parts of the story. The bad guys, called the Ra, are from the Previous Universe. Knowing that their reality was about to undergo a Big Crunch and therefore wipe them out, the Ra decided to use some variety of space/time travel to come to our expanding universe, where they would be able to take over. They never call it time travel, but I feel like that’s exactly what it is. The universes are treated like parallel things instead of sequential ones, and that was one of the things that bugged me in this book. In addition to all that, there’s a sort of a space between the two universes, and that’s where they build the Chaos Weapon, because in that intermediary space there is no entropy or anything and the weapon is easier to use. I guess? It’s suggested that in the Earlier Universe entropy runs backward, effects precede causes, and things like that, none of which make any sense to me and also make me wonder how the Ra manage to survive when they come over to our universe. Just one of many, many questions I have about this book. Kasdeya and his crew are actually Ra, but they decided that they didn’t like the way the other Ra were doing things, so they split off and have been on the run for many centuries, due to time dilation. Oh, and there’s one more thing. At some point the Ra came across and seeded our planet, so in a way we’re Ra too. The reason the Ra want to wipe us out with the Chaos Weapon is simple. We’re competition. There’s simply not enough room in the ENTIRE UNIVERSE for both of our species to exist. Somebody actually brings this up, asking why the entirety of creation wouldn’t be enough room for two species. The response was along the lines that humanity is growing too quickly and would have the entire universe all filled up in a few short centuries. So that’s fine, I guess. The Indomitable Human Spirit triumphs again. It turns out that Jym has a god. Presumably his space marshal pals have gods too. Jym’s god is named Coul and it lives on his shoulder in a sort of symbiotic relationship. Coul protects Wildheit from mortal harm and sometimes is willing to use another space marshal’s god to communicate with said space marshal. This bit felt very much like a tacked-on thing that didn’t have to be there. A sort of detail that every once in a while came into play but not nearly enough to justify it. A lot of this book felt like that, to be honest. The main plot didn’t hold together all that well and there were lots of things that felt like they were more or less there to bring up the word count. Jym and Kasdeya find themselves at the Big Crunch of the previous universe for some reason. It had something to do with a space jump gone wrong thanks to the Chaos Weapon, but the Big Crunch itself had very little to do with the Chaos Weapon. It was going to happen anyway, although the book kept emphasizing the fact that Wildheit was there and that his presence was somehow instrumental in the collapse of the previous universe. I’m going to come clean here and point out that I hardly remember the last quarter of this book. I know that the Chaos Weapon got destroyed. Something called Hellburners were involved. Oh, and there were black holes, too. Apparently the Chaos Weapon needed black holes to work. I think, and don’t hold me to this but I’m pretty sure I’m remembering correctly, but I think that somehow the protagonists managed to turn the Chaos Weapon back in on itself so that the black holes lost stability and then ate everything. Pretty sure that’s what happened. We cut to sometime in the future. Wildheit has settled down on Mayo and it turns out that his kid is psychic and there’s something ominous said about that. While I had a lot of trouble keeping up with what was supposed to be going on in this book, I still want to point out that I didn’t hate it, at least not on the level that I hated The Ion War. I didn’t feel like the villains in The Chaos Weapon were inherently stupid, for one thing. I think they actually had a pretty good motivation, even if it did require wiping out most of humanity. Self-preservation is powerful stuff, and it’s hard to begrudge somebody that, even if it’s obvious that cooperation would have helped them out a lot more than the alternative. People don’t behave rationally when their very existence is on the line, and so for that I have to credit the Ra with being pretty reasonable villains. At one point it was stated that the titular weapon was so powerful that when it fired it changed the value of π across a radius of about five light years. I like that. It doesn’t make a lot of sense but I like it anyway. And of course, we can now judge that the volume of space affected by this event is changed even if the radius remains constant! That gives me a headache. 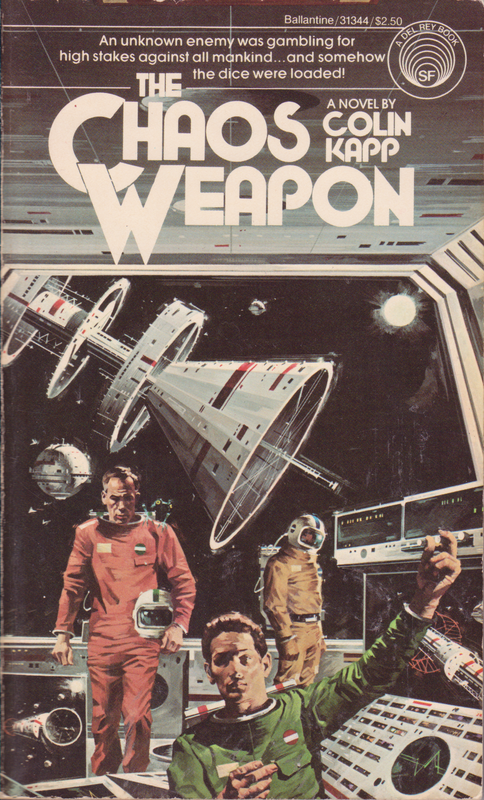 Another thing I like is that I’m pretty sure the guy on the cover in the orange space suit is Lee Marvin. On the whole, though, I can’t really call this a good book. It had its strengths in terms of idea, but the execution left a lot to be desired. One gets the feeling that the author felt like he had a good idea but that over time it turned out not to make much sense and by the time he realized that the book was mostly done and the deadline was creeping up. As a result, a lot of padding had to be tacked on, padding that itself didn’t hold together all that well, and from there the whole thing collapsed on itself. It’s still better than I thought it would be. Thanks. I have always thought the guy on the cover of this book is Lee Marvin. And, I’m pretty sure the guy in the foreground is calling out “Over here! Pepperoni – No Anchovies…” to the pizza guy who just entered the, uh… office. I thought at first that the fella in the helmet had his hands in his pockets. Normally, I’d love this kinda cover but this one looks cluttered and meaningless.